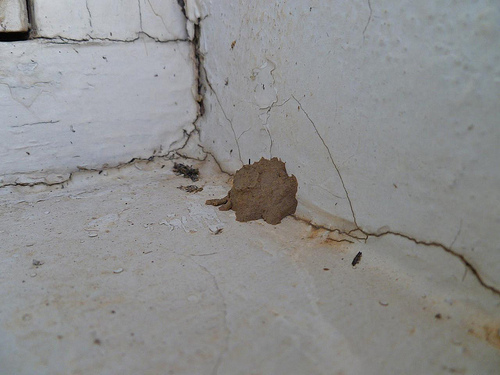 I spotted this tiny pot-like thing on my kitchen window-sill yesterday, about 1.5cm across. As soon as I saw it I thought “wasp!” — not sure why. The entrance with the lip around it is amazing. 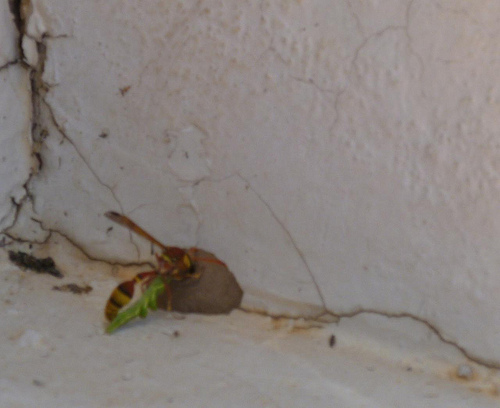 Shortly after noticing this, sure enough a wasp or a hornet-type thing appeared and went to the entrance. Strange-looking, with loads of green bits hanging underneath…. It went away and came back after a few minutes. It was only then that I realised the green bits underneath was actually a live caterpillar that it was carrying. It placed it at the entrance, seemingly head-first, and buzzed around. Amazingly it got hold of the caterpillar and stuffed it inside. It had done this with at least two of them. I was a bit wary of the wasp because I was trying to get really close to photograph it, but a couple of times it came after me. The third time I saw it come back, instead of a caterpillar it had some more of the grey material in its jaws. It sealed up the entrance. It went away a couple more times and and came back with more material to shore up the structure. I’ve never seen anything like this… felt like having my own private nature documentary laid on for me right next to where I was eating my lunch! 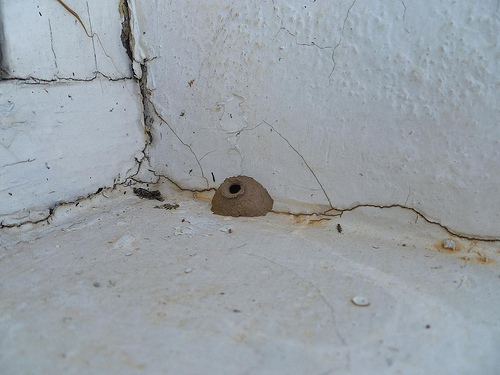 I’m assuming the wasp had laid eggs in the caterpillars, and was storing them away so the larvae have a ready source of food when they hatch. 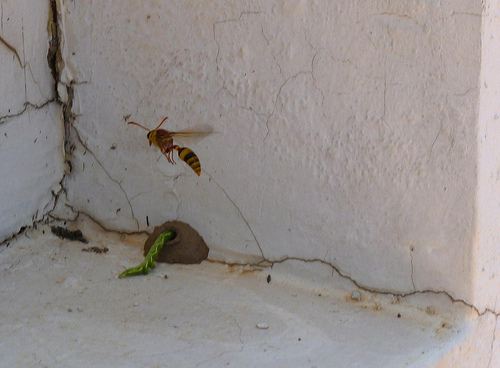 Wasps do horrible stuff like that, don’t they?